Chronic conditions have a significant impact on the quality of life of Hispanics, with the first two leading causes of death among Hispanics being cancer and heart disease (CDC. Health of Hispanic or Latino population, 2016b. http://www.cdc.gov/nchs/fastats/hispanic-health.htm). Research indicates that Hispanics with chronic care conditions are more likely to be diagnosed and begin treatment after the disease has progressed, less likely to engage with the treatment recommended, more likely to report more barriers to the self-management of their conditions, and to overall experience a poorer quality of life following diagnosis. 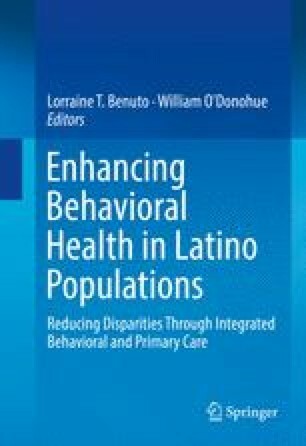 Thus, the aim of this chapter is to explore the most commonly diagnosed chronic conditions in Hispanics in integrated care, how these affect the Hispanic patient, and to illustrate how BHPs can work with the Primary Care Provider (PCPs) in order to improve the health of Hispanics living with chronic conditions while drawing from evidence-based guidelines, when available. Agency for Healthcare Research and Quality. (2011). National healthcare disparities report. Retrieved from http://www.ahrq.gov/qual/nhdr10/nhdr10.pdf. AHRQ AfHRaQ Minority Health. (2009). Recent findings. Retrieved from http://www.ahrq.gov/research/minorfind.pdf. American Cancer Society. (2015a). Cancer facts and figures 2015. Retrieved from http://www.cancer.org/acs/groups/content/@epidemiologysurveilance/documents/document/acspc-036845.pdf. American Cancer Society. (2015b). Cancer facts and figures for Hispanics/Latinos 2015–2017. Retrieved from http://www.cancer.org/acs/groups/content/@epidemiologysurveilance/documents/document/acspc-034778.pdf. American Cancer Society. (2016a). Cancer facts and figures 2016. Retrieved from http://www.cancer.org/acs/groups/content/@research/documents/document/acspc-047079.pdf. American Cancer Society. (2016b). Cancer facts and figures for Hispanics/Latinos. Retrieved from http://www.cancer.org/acs/groups/content/@research/documents/document/acspc-046405.pdf. American Cancer Society. (2016c). What is cancer? A guideline for patients and families. Retrieved from http://www.cancer.org/cancer/cancerbasics/what-is-cancer. American Cancer Society. (2016d). Types of biopsies used to look for cancer. Retrieved from http://www.cancer.org/treatment/understandingyourdiagnosis/examsandtestdescriptions/testingbiopsyandcytologyspecimensforcancer/testing-biopsy-and-cytology-specimens-for-cancer-biopsy-types. American Cancer Society. (2016e). CT scan for cancer. Retrieved from http://www.cancer.org/treatment/understandingyourdiagnosis/examsandtestdescriptions/ct-scan-for-cancer. American Cancer Society. (2016f). MRI for cancer. Retrieved from http://www.cancer.org/treatment/understandingyourdiagnosis/examsandtestdescriptions/mri-for-cancer. American Cancer Society. (2016g). Ultrasound for cancer. Retrieved from http://www.cancer.org/treatment/understandingyourdiagnosis/examsandtestdescriptions/ultrasound-for-cancer. American Cancer Society. (2016h). X-rays and other radiographic tests for cancers. Retrieved from http://www.cancer.org/treatment/understandingyourdiagnosis/examsandtestdescriptions/x-rays-and-other-radiographic-tests. American Diabetes Association. (2014). Diabetes among Hispanics: All are not equal. Retrieved from http://www.diabetes.org/newsroom/press-releases/2014/diabetes-among-hispanics-all-are-not-equal.html?referrer=https://www.google.com/. American Diabetes Association. (2016). Diagnosing diabetes and learning about prediabetes. Retrieved from http://www.diabetes.org/diabetes-basics/diagnosis/?referrer=https://www.google.com/. American Heart Association. (2013). Hispanics/Latinos & CVD – 2013 statistical fact sheet. Retrieved from https://www.heart.org/idc/groups/heart-public/@wcm/@sop/@smd/documents/downloadable/ucm_319572.pdf. American Heart Association. (2014). Tips for eating Mexican food. Retrieved from http://www.heart.org/HEARTORG/HealthyLiving/HealthyEating/DiningOut/Tips-for-Eating-Mexican-Food_UCM_308411_Article.jsp#.VuRwOJMrI_U. American Heart Association. (2016). Hispanics and heart disease, stroke. Retrieved from http://www.heart.org/HEARTORG/Conditions/More/MyHeartandStrokeNews/Hispanics-and-Heart-Disease-Stroke_UCM_444864_Article.jsp#.VukcguIrLRY. Andersen, B. L., Farrar, W. B., Golden-Kreutz, D., Emery, C. F., Glaser, R., Crespin, T., & Carson, W. I. (2007). Distress reduction from a psychological intervention contributes to improved health for cancer patients. Brain, Behavior, and Immunity, 21(7), 953–961. doi: 10.1016/j.bbi.2007.03.005. Bailey, G. R., Barner, J. C., Weems, J. K., Leckbee, G., Solis, R., Montemayor, D., & Pope, N. D. (2012). Assessing barriers to medication adherence in underserved patients with diabetes in Texas. The Diabetes Educator, 38(2), 271–279. doi: 10.1177/0145721711436134. Buerau of Labor Statistics. (2015). Hispanics and Latinos in industries and occupations. Retrieved from http://www.bls.gov/opub/ted/2015/hispanics-and-latinos-in-industries-and-occupations.htm. CDC. (2009). Differences in prevalence of obesity among Black, White, and Hispanic adults – United States, 2006-2008. Retrieved from http://www.cdc.gov/mmwr/preview/mmwrhtml/mm5827a2.htm. CDC. (2013). Cardiovascular disease is the leading cause of death among US Hispanics. Retrieved from http://www.cdc.gov/features/MillionHeartsHispanic/. CDC. (2015). Fast facts: Smoking & tobacco use. Retrieved from http://www.cdc.gov/tobacco/data_statistics/fact_sheets/fast_facts/. CDC. (2016a). Chronic disease overview. Retrieved from http://www.cdc.gov/chronicdisease/overview. CDC. (2016b). Health of Hispanic or Latino population. Retrieved from http://www.cdc.gov/nchs/fastats/hispanic-health.htm. Center for Mental Health Services. (2001). Cultural competence standards in managed care mental health services: Four underserved/underrepresented racial/ethnic groups. Retrieved from http://www.mentalhealth.org/publications/allpubs/SMA00-3457/. Centers for Disease Control and Prevention. (2011). Obesity: Halting the epidemic by making health easier: At a glance. Retrieved from http://www.cdc.gov/chronicdisease/resources/publications/aag/obesity.htm. Department of Health and Human Services. (2016). What is stress testing?. Retrieved from https://www.nhlbi.nih.gov/health/health-topics/topics/stress. Ell, K., Xie, B., Kapetanovic, S., Quinn, D., Lee, P., Wells, A., & Chou, C. (2011). One-year follow-up of collaborative depression care for low-income, predominantly Hispanic patients with cancer. Psychiatric Services, 62(2), 162–170. doi: 10.1176/appi.ps.62.2.162. Fiore, M. C., Jaén, C. R., Baker, T. B., Bailey, W. C., Benowitz, N. L., Curry, S. J., … Henderson, P. N. (2008). Treating tobacco use and dependence: 2008 Update—Clinical practice guideline. Retrieved from http://www.ahrq.gov/sites/default/files/wysiwyg/professionals/clinicians-providers/guidelines-recommendations/tobacco/clinicians/update/treating_tobacco_use08.pdf. Gallo, L. C., Roesch, S. C., Fortmann, A. L., Carnethon, M. R., Penedo, F. J., Perreira, K., … Isasi, C. R. (2014). Associations of chronic stress burden, perceived stress, and traumatic stress with cardiovascular disease prevalence and risk factors in the Hispanic Community Health Study/Study of Latinos sociocultural ancillary study. Psychosomatic Medicine, 76(6), 468–475. doi: 10.1097/PSY.0000000000000069. Graves, K. D., Jensen, R. E., Cañar, J., Perret-Gentil, M., Leventhal, K.-G., Gonzalez, F., … Mandelblatt, J. (2012). Through the lens of culture: Quality of life among Latina breast cancer survivors. Breast Cancer Research and Treatment, 136, 603–613. Retrieved from http://dx.doi.org/10.1007/s10549-012-2291-2. Heller. (2006). New Hispanic nutrition guidelines promote healthy eating. Retrieved from http://www.foodnavigator-usa.com/Suppliers2/New-Hispanic-nutrition-guidelines-promote-healthy-eating. Lee, C. S., López, S. R., Colby, S. M., Rohsenow, D., Hernández, L., Borrelli, B., & Caetano, R. (2013). Culturally adapted motivational interviewing for Latino heavy drinkers: Results from a randomized clinical trial. Journal of Ethnicity in Substance Abuse, 12(4), 356–373. doi: 10.1080/15332640.2013.836730. Lloyd-Jones, D., Adams, R., Brown, T., Carnethon, M., Dai, S., De Simone, G., … Lisabeth, L. (2010). Heart disease and stroke statistics -- 2010 Update: A report from the American Heart Association. Circulation, 121(7), e46–215. doi: 10.1161/CIRCULATIONAHA.109.192667. Mayo Clinic. (2016a). Diabetes risk factors. Retrieved from http://www.mayoclinic.org/diseases-conditions/diabetes/basics/risk-factors/con-20033091. Mayo Clinic. (2016b). A1C test. Retrieved from http://www.mayoclinic.org/tests-procedures/a1c-test/home/ovc-20167930. Mayo Clinic. (2016c). Glucose tolerance test. Retrieved from http://www.mayoclinic.org/diseases-conditions/diabetes/basics/definition/prc-20014814. Mayo Clinic. (2016d). Oral glucose tolerance test. Retrieved from http://www.mayoclinic.org/tests-procedures/glucose-tolerance-test/basics/results/prc-20014814. Mayo Clinic. (2016e). Heart Disease. Retrieved from http://www.mayoclinic.org/diseases-conditions/heart-disease/basics/definition/con-20034056. Mayo Clinic. (2016f). Heart disease risk factors. Retrieved from http://www.mayoclinic.org/diseases-conditions/heart-disease/basics/risk-factors/con-20034056. Mayo Clinic. (2016g). Heat disease tests and diagnosis. Retrieved from http://www.mayoclinic.org/diseases-conditions/heart-disease/basics/tests-diagnosis/con-20034056. Mayo Clinic. (2016h). High blood pressure (hypertension). Retrieved from http://www.mayoclinic.org/diseases-conditions/high-blood-pressure/basics/definition/con-20019580. Mayo Clinic. (2016i). High blood pressure (hypertension) causes. Retrieved from http://www.mayoclinic.org/diseases-conditions/high-blood-pressure/basics/causes/con-20019580. Mayo Clinic. (2016j). High blood pressure (hypertension) tests and diagnosis. Retrieved from http://www.mayoclinic.org/diseases-conditions/high-blood-pressure/basics/tests-diagnosis/con-20019580. Mayo Clinic. (2016k). Cancer definition. Retrieved from http://www.mayoclinic.org/diseases-conditions/cancer/basics/definition/con-20032378. Mayo Clinic. (2016l). Cancer tests and diagnosis. Retrieved from http://www.mayoclinic.org/diseases-conditions/cancer/basics/tests-diagnosis/con-20032378. MedlinePlus. (2016). Endoscopy. Retrieved from https://www.nlm.nih.gov/medlineplus/endoscopy.html. National Hispanic Caucus of State Legislators (NHCSL). (2010). Hispanic obesity: An American crisis. Retrieved from http://www.nhcsl.org/issues/healthcare/Hispanic-Obesity-An-American-Crisis.pdf. National Institute on Drug Abuse. (2012). Medical consequences of drug abuse. Retrieved from https://www.drugabuse.gov/publications/medical-consequences-drug-abuse/cardiovascular-effects. NIH. (2014). Diagnosis of diabetes and prediabetes. Retrieved from http://www.niddk.nih.gov/health-information/health-topics/Diabetes/diagnosis-diabetes-prediabetes/Pages/index.aspx. NIMH. (2014). Major depression among adults. Retrieved from http://www.nimh.nih.gov/health/statistics/prevalence/major-depression-among-adults.shtml. ODPHP. (2016). 2015–2020 Dietary Guidelines for Americans. Retrieved from http://health.gov/dietaryguidelines/2015. Osborn, C., Amico, K., Cruz, N., O’Connell, A., Perez-Escamilla, R., Kalichman, S., … Fisher, J. (2010). A brief culturally tailored intervention for Puerto Ricans with type 2 diabetes. Health Education & Behavior, 37(6), 849–862. doi: 10.1177/1090198110366004. Pabon-Nau. (2010). Effects of anxiety or depression on cancer screening among Hispanic immigrants. Retrieved from https://www2.massgeneral.org/disparitiessolutions/z_files/Lina%20Pabon%20Nau_CHIS.pdf. Rosal, M., Ockene, I., Restrepo, A., White, M., Borg, A., Olendzki, B., … Reed, G. (2011). Randomized trial of a literacy-sensitive, culturally tailored diabetes self-management intervention for low-income Latinos: Latinos en control. Diabetes Care, 34(4), 838–844. doi: 10.2337/dc10-1981. Schoenthaler, A., De La Calle, F., Barrios-Barrios, M., Garcia, A., Pitaro, M., Lum, A., & Rosal, M. (2015). A practice-based randomized controlled trial to improve medication adherence among Latinos with hypertension: Study protocol for a randomized controlled trial. Trials, 16(1), 1. doi: 10.1186/s13063-015-0815-x. Stagl, J. M., Bouchard, L. C., Lechner, S. C., Blomberg, B. B., Gudenkauf, L. M., Jutagir, D. R., … Antoni, M. H. (2015). Long-term psychological benefits of cognitive-behavioral stress management for women with breast cancer: 11-Year follow-up of a randomized controlled trial. Cancer, 121(11), 1873–1881. doi: 10.1002/cncr.29076. United States Census Bureau. (2015). Quick facts Reno, Nevada. Retrieved from http://www.census.gov/quickfacts/table/PST045215/3260600. Wu, S., Ell, K., Gross-Schulman, S. G., Sklaroff, L. M., Katon, W. J., Nezu, A. M., … Guterman, J. J. (2014). Technology-facilitated depression care management among predominantly Latino diabetes patients within a public safety net care system: Comparative effectiveness trial design. Contemporary Clinical Trials, 37(2), 342–354. doi: 10.1016/j.cct.2013.11.002.